Tonight I wasn’t planning on blogging; Matt and I are exhausted after our football Sunday excursions yesterday. But as he was hungover on the couch after work he asked me what was for dinner, and I felt too bad for the pour drunken soul to turn him down. And I kept asking “Well, what do you want? Tell me what you want and then I can make it!” but Matt NEVER gives me any ideas for dinner. I knew I wanted something healthy, and easy, and cheap. 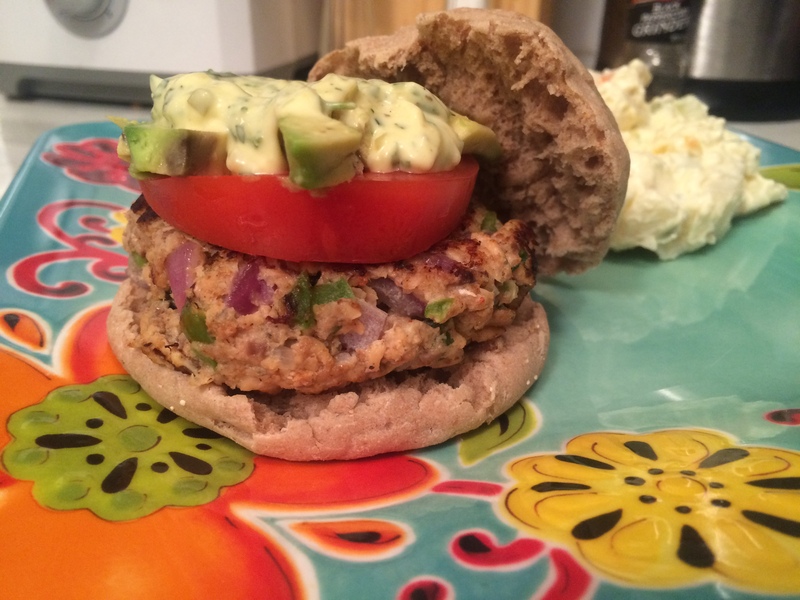 So Voila: Herbed Salmon Burgers with Herbed Tartar sauce. 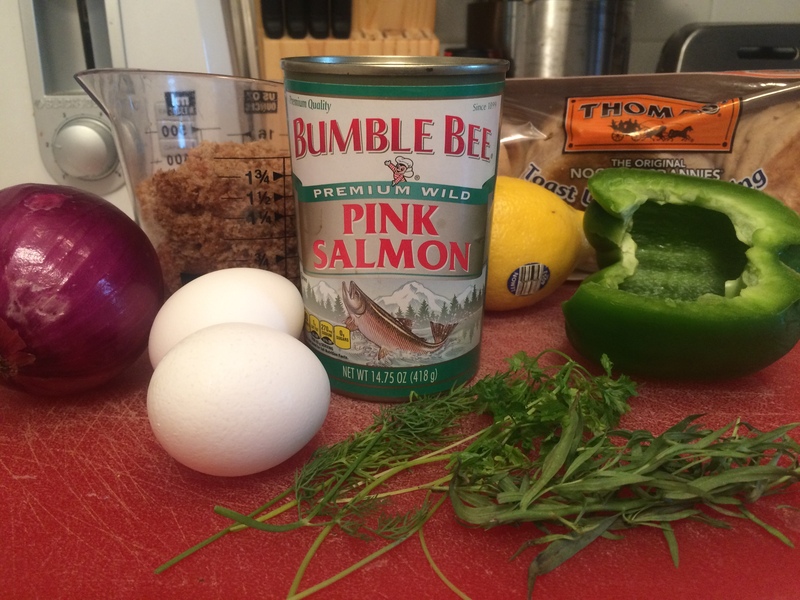 The salmon burger recipe started off as pretty standard, but then I thought that since I was already cooking I might as well spruce it up and then blog it later! I found one of those packs of Infinite fresh herbs at the super market for seafood that has tarragon, dill, and chervil, and there was a recipe for herbed tartar sauce on the back too! So that was my inspiration. I added the herbs to the patties and also made the tartar sauce. And I used a whole wheat English muffin as the bun because they say it’s supposedly “healthier”. Bleh. But that’s what I usually use and they still taste delish. I served them with potato salad (for Matt… not for me because I’m “healthy” and such, ugh), and steamed broccoli. These would also be good with mixed greens or basically any other side dish you could imagine. 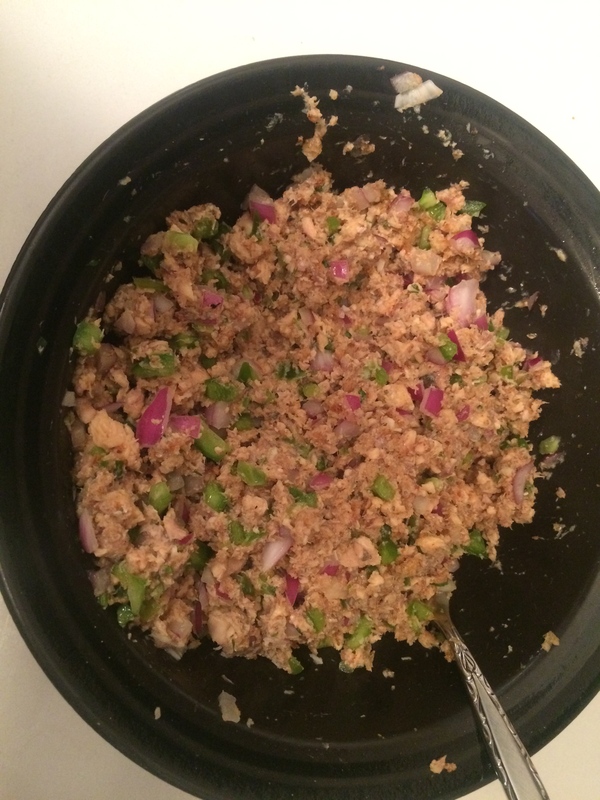 To start off, I toasted 4 slices of bread and chopped it up in the food processor to make a cup of breadcrumbs. Then I basically just combined all the ingredients together: the canned salmon, onions, pepper, spices, lemon, garlic, eggs, and breadcrumbs. Then I formed them into six patties and fried them in A LITTLE bit of olive oil, about 4 minutes on each side or until fried brown. As a side note: the olive oil I used was lemon-infused, and I picked it up at La Boqueria in Barcelona when we went in May 🙂 Anyways, you have to be very careful when flipping these! Since they’re so hot they crumble easily; you’ve got to make sure the underside is pretty toasty-brown before you flip. They will also harden up when they cool. 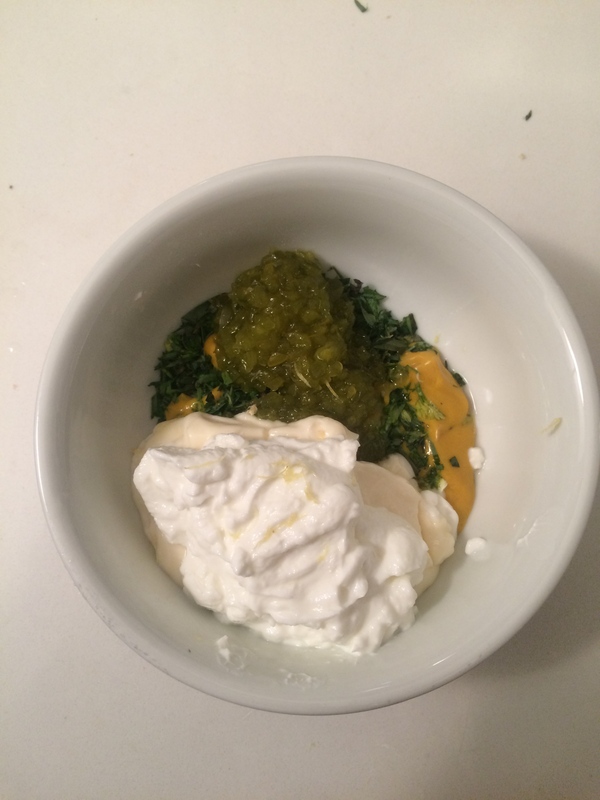 I whipped up the tartar sauce pretty quickly. The original recipe called for capers but I just left those out because I didn’t have them, but feel free to add some yourself! I was pleasantly surprised at the outcome, it was pretty sweet and tangy and I was quite satisfied. All in all, this recipe is great for an easy weeknight meal or when you’re feeling lazy (or hungover). Be sure to top the burgers with slices of yummy salted tomatoes and avocados, and maybe another splash of lemon. Toast about 4 slices of whole wheat bread and then chop it up finely in the food processor, to make 1 cup of breadcrumbs. Mix all patty ingredients in a bowl until wet and mixed throughout. Heat 1 Tablespoon olive oil in a pan on medium-high heat. 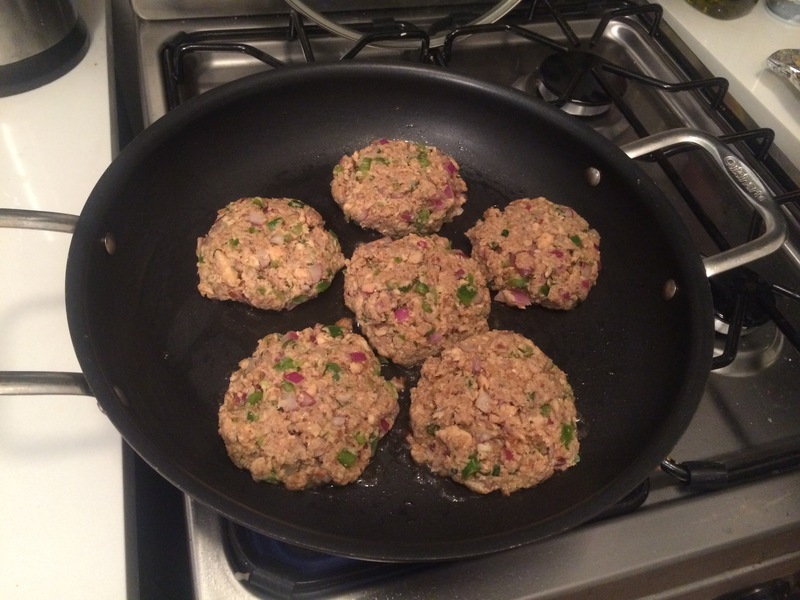 Place patties in hot pan and cook until dark brown on the bottom, about 4-5 minutes. Flip, and repeat. Be careful flipping and moving the patties. Meanwhile mix together all ingredients for tartar sauce until thoroughly combined. Place patties on a toasted English muffin and top with tartar sauce, tomato, and avocado. Serve and enjoy. This sounds so yummy! Make it for Mama!